plan 386Provide Safe Drinking Water in Vadaagaram Village & Sanitation facility in Endiyur Village of Marakkanam Block of Villupuram District, Tamil Nadu. 1. The major rivers and status of underground water table of the district is stated, but is the same situation applied at the micro level in selected two villages? 2. The description of the village community / target group, such as their main occupation, caste, living conditions, problems of the area, economic status etc. 3. Information about the present situation of the drinking water, i.e. availability of water sources, whether they fetch water from open wells / hand-pumps or existing piped scheme etc. Since you have proposed installation of water treatment plant, we understand that the same will be installed on the existing water supply scheme. Could you please explain about the water treatment plant? 4. It would be helpful if you could furnish the detailed activity wise budget, so as to get clarity of the proposed activities. 5. You have proposed the construction of eco-san toilets. The cost of the eco-san toilet is quite high compared to the common pit model. Is there any special reason for the same? 6. Out of 100 households, about 25 have sanitation facilities. You have proposed to construct 25 units. What is the plan for sanitation for the remaining families? 7. You are planning to avail the subsidy of Rs. 2,500/- for the construction of toilets per family from the DRDA. As per my knowledge, the DRDA provides subsidies only to the BPL families. Are all the families are below poverty line? If yes, the cost of eco-san toilet is very high (Rs.12000 to 15000), then how will the BPL families manage such high contribution? 8. The per person cost of the project works out to more than 55$. It seems very high. Could you please justify how such high assistance can be given? We already installed 5 safe drinking water plant in the area of pondy to Tindivanam road and one village which is 10 kilometer away from the seashore. In 4 villages we fixed bacterial and chemical free plant and RO plant is installed in one village where the salinity is very high. The proposed project area is nearer to seashore where the water quality is unsatisfactory for drinking purpose. We will do the analysis and fix the suitable RO plant for the community. The bore well is the main source for the water supply which is stored in the big OHT, the water supplies through street taps for drinking, bathing,etc. Detailed activity budget is enclosed for your kind information. Palmyra has built septic tank module toilet as well as eco san toilet in the project area. Eco-san is built in coastal area. Flush type toilet is built in agriculture area in Vanur & Marakkanam block. The people expect septic tank toilet module for agriculture area. The estimate is given for flush type not for eco san toilet. In the village atleast 5% of the families are having toilet facility. We will construct 25 toilets in the village which will boost the other people to involve in sanitation facility. In general, 80% of the families are belongs to the BPL family in the rural area. 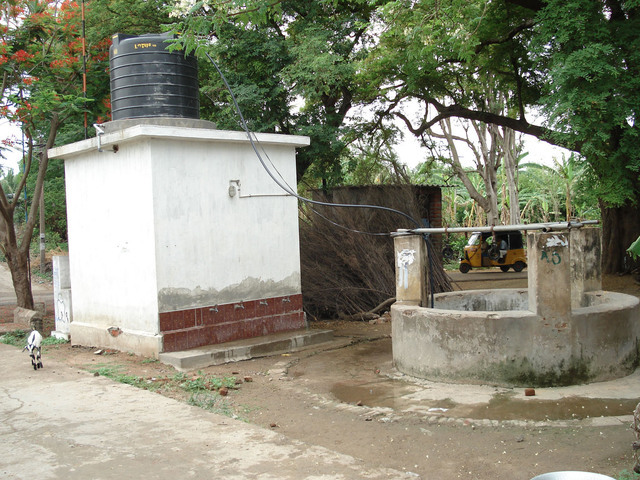 The Tamilnadu government is promoting the sanitation facility for the rural people. All these beneficiaries will definetly get the subsidy from the government through Palmyra and SHGs. The maintenance cost is mainly mentioned for safe drinking water project. While the plant is eracted, the revenue will be collected from the beneficiaries and keep it in the bank account in the user group name. This revenue will be used as maintenance cost for the further period for sustainable function of the activity. Are there going to be 2 water supplies? One for drinking and one for all other uses? I realize its your first time in the PWX Q&A and it can get busy. Looking forward to a response to this and Thomas' questions above. Purified water will be stored in one new syntex tank or cement tank. The people will come and collect the purified water for drinking purpose only. What is the exact purification technology? Is it membrane (RO) based? Or UV? Or water softening? Please provide a more detailed budget for the project. I attached the previous activity report of CFLI - you please refer page no.22. It will give you explanation about the RO Plant. I have attached 2 reports in the application form. One is about the RO plant which is implemented under CFLI project in one remore village is called Koyalmedu. The other one is safe drinking water project which was funded by AVALOKITA &BWNI, Holland. The detailed evaluation report is also attached. Could you pl. guide me what would be the next step. Thanks Dhanam for your clarification and unit cost of toilet construction and the evaluation report. Looking at the total cost of Rs. 22,000 it is very high for the BPL families. If the above cost is subsidized substantially under the govt. scheme then it is OK.
We would like to share our experience with you. In our area, the unit cost of toilet is between Rs. 10,000 to 12,000. Out of which the subsidy of Rs. 2,200 can be availed from govt. by BPL families. Even though the BPL families find it very difficult to mobilize the balance funds. The question / answer session has provided clarity to the project, what I would like to understand more is how would the community manage the maintenance fund, which seems high? What is the role of the WATSAN committee vis a vis SHG members who would run the plant? sorry for coming late on the questions. You question is very valid. 1. Discussion with the PRI, Women groups, WUA, Schools and Health department. 2. Do the water analysis. 3. Formation of Safe drinking water user group. 6. Plant eraction with suitable place, electricity, water supply, etc. 8. 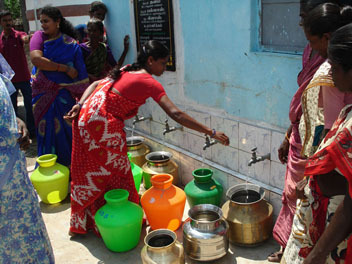 Collection of water cess while supply the water either daily/monthly through card system. 9. Deposit the money in the bank account for further maintenance. One family may pay Rs.50 x 10 months = 500. If 100 families pay Rs.500x100 = 50000 cess amount will be collected in a year. This amount will be used for operater salary cost, maintenance of the resources. it is not easy to collect even single rupee from the beneficiary, they say the government is giving free of cost, why should I pay the water cess. It is our responsibility to explain them through awareness program, exposure visit, vishual pictures, etc about the expenditure incured due to water borne disease. During the end of the project period, slowly the PIA will withdraw from the activity and handed over the asset to the User Group with appropriate resolution. Thanks Dhanam for the reply. So within what time is there a break even of the cost of installing the water purification? The break even of the cost of water treatment plant will be covered in 3 years period. The project tries to address the issue of water and sanitation through technology interventions and institution process and it seems that they have put in effort to really explain all the questions raised that had helped clarify the project . he project builds upon past success, which is a strong precedent and predictor of future success. However, the cost-benefit ratio for output (500) and cost ($27,607) could be stronger. The treatment plant absorbs most of the cost, which should be scaled to provide higher output somehow. The biggest question is the maintence cost at $7,500 which is a big concern when only approximately $2,700 can be raised as community contribution in the first place. 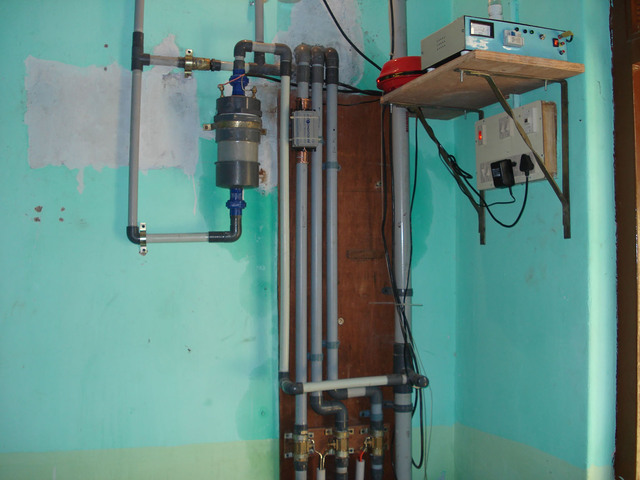 Roughly speaking, schemes that provide plenty of water of good quality are relatively expensive and schemes which filter the water either require filtering units that are quite large and involved or are small house units that provide little water every day if they are really efficient at purifying. The scheme provided here claims to purify water within a very small surface or volume (though it is not at all explicit about the yearly yiell of one of these units. The quantity of water that a family disposes of is as important as its quality and so the output of these individualo filters is a critial parameter. My opinion is that its effectiveness is not documented (only asserted) and given the technical details provided these claims are unlikely to be for real. This is Palmyra's first application so the interactivity needs to be a learning experience. I thought the solution was too hi-tech until i realized the density that the project is working in and its much a peri-urban than a rural setting (compared to the rest of the project areas in PWX). The rating is based on the history of installation of previous water treatment plants one of which was for salinity control and the history of ecosan composting toilets installations. Did not have time to ask questions on this application, but would have asked about water table stability for well. All the best for the project implementation.